Editor’s Note: This post is featured on the Disney Blog Carnival #34. Read more great posts about all things Disney! In honor of one month ’til I’m back at my most favorite place on Earth – Walt Disney World – I decided to make my first batch of cake pops. Cake pops are little balls of crumbled cake and frosting that are then covered in candy or chocolate coating and decorated with more candy, sugar crystals or sprinkles. These little sugary treats have been popping up all over WDW the past year or so (check out Disney Food Blog’s intro on the cake pop infiltration), and they have also seen a rise in popularity from Bakerella. The process of making cake pops is very labor intensive. Be sure to do your homework on this project before you start. It helps to know all of the materials you’ll need (styrofoam blocks, paper sticks, candy coating, etc.) in advance so you’re not scrambling for items in the midst of dipping or forming the pops – since the candy coating sets fairly quickly. 1 box cake mix – I made a vanilla cake with a buttercream frosting. Instead of using my own recipe, I opted for a box mix. I baked per the box instructions for a 13×9 cake the night before and let it cool completely overnight. *One cake makes about 48 cake pops. If you don’t need that many, then cut the cake in quarters and freeze any cake sections for another day. You’ll need at least one ounce of candy coating for each generic Mickey Mouse cake pop you plan on dipping and more for any extra decorating. 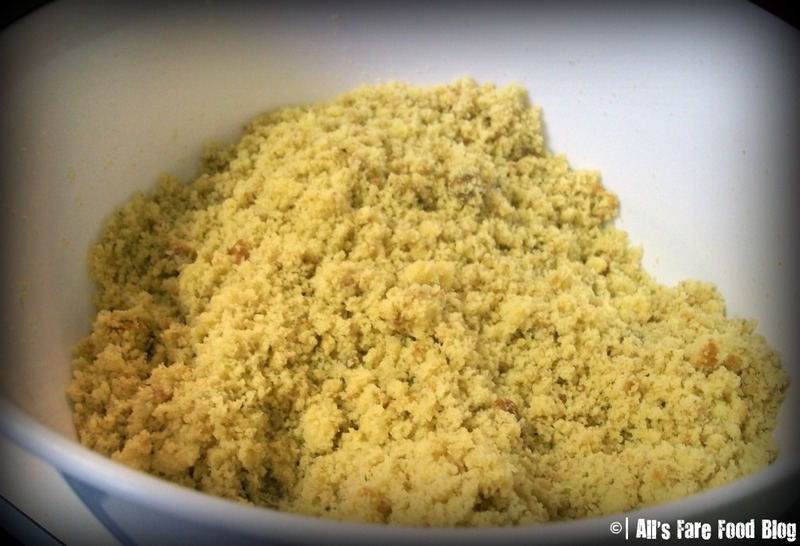 After cake is baked and cooled completely, crumble into a large bowl. The easiest way to do this is cut the cake into quarters, then working with a quarter at a time, rub the cake between both hands into a large bowl. Continue with the other three quarters of the sheet cake. Use a fork to crumble and break down any large pieces that remain. You want this mixture to be quite fine. Next, with a large, metal spoon, add about 3/4 of the can of frosting to the cake and mix thoroughly. You won’t need the rest of the frosting, so feel free to chow down on that as you go. To make the cake balls, roll the cake/frosting mixture into quarter-size cake balls and place on a wax paper covered baking sheet. Place into the freezer for about 15 minutes or in the fridge for a few hours to firm up. 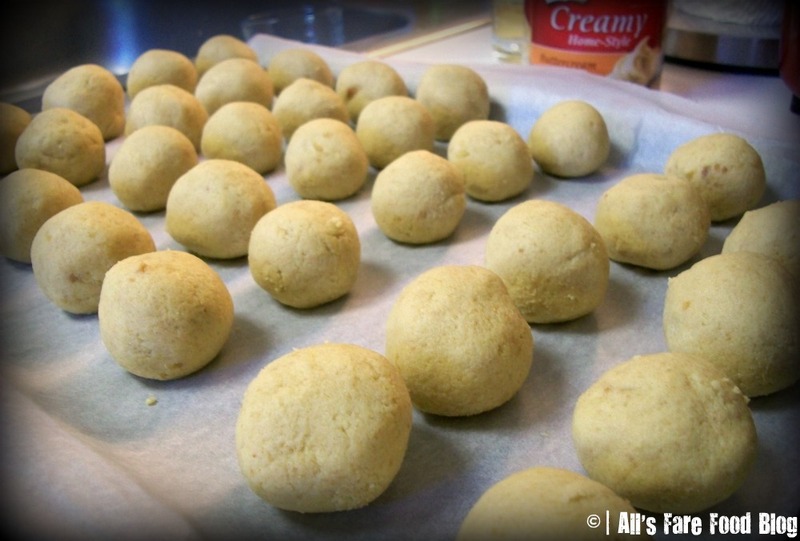 Be sure to transfer to the fridge from the freezer, so you avoid freezing the cake balls completely. If you’re using chocolate candy discs for the ears, you can prepare those now. Use round chocolate candy melts and using a round cutter, cut off a small portion of each candy melt. Set the ears aside. Melt your candy coating in a heat-proof plastic bowl so that the coating is at least three to four inches deep for dipping. Melt in the microwave in 30 second intervals on medium, stirring in between. Repeat until melted and smooth. Remove 6-8 cake balls from the fridge at a time. Remove and allow any excess coating to fall off the pop and back into the bowl. To get rid of excess coating (using the hand not holding the cake pop), lightly tap the wrist holding the cake pop and rotate. The excess coating will begin to fall into the bowl. You can also coax some extra coating off with a toothpick. Place in a styrofoam block to dry. Finally, I wanted to add a pop of color so I bought an “accent” color of red candy coating. I followed the instructions on the candy decorating bag – filled it with the candy and heated it in the microwave in 30 second spurts (kneading it in between) until it was melted. 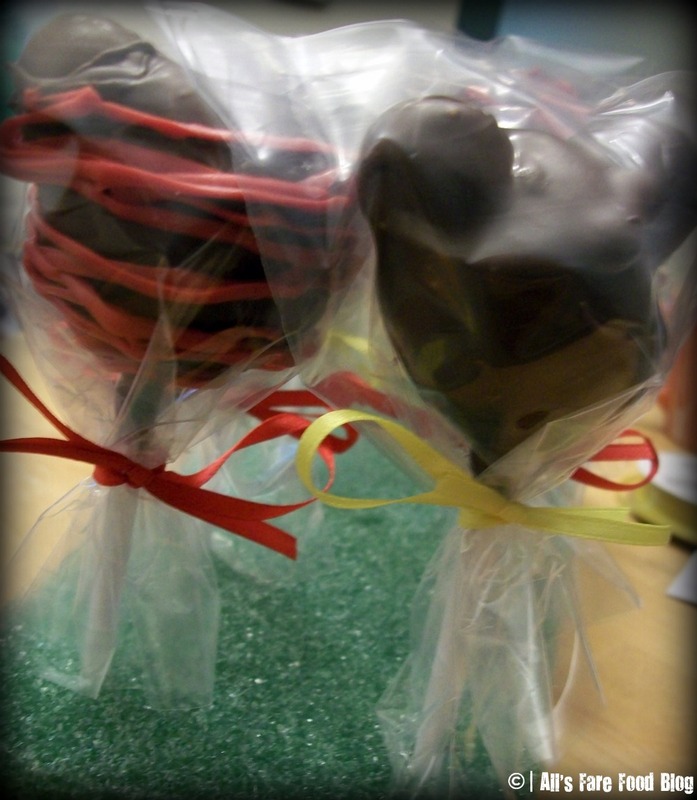 Then, I snipped a little portion off the end and drizzled the red candy coating over the dark chocolate Mickey Mouse cake pops. Finally, when your Mickeys are complete, wrap in small, clear treat bags and tie with a decorative ribbon or a twisty tie. The end result: a hard, sweet exterior, followed by an uber-moist and decadently-sweet cake/frosting interior. The crunchy Whoppers with the malt-like candy added some more flavors to the vanilla and chocolate. The whole process to make about 45 Mickey Mouse cake pops took about 6 hours, including baking, crumbling and mixing, then forming and dipping, and finally wrapping. It’s a very labor intensive project for a snowy afternoon (just like we had in New England after our first Nor’easter this weekend) so I didn’t feel like it was a waste of my time. It’s definitely a sweet treat that I’m glad I made and even better knowing that in 30 days I’ll be checking in to Animal Kingdom Lodge. Jambo! This entry was posted in Cuisine - Desserts, Disney, Disney World, Recipes and tagged Bakerella, cake, cake pops, chocolate, desserts, Disney Food Blog, Disney World, Mickey Mouse, recipe by Christina. Bookmark the permalink. Awesome, Christina! Vinnie and Blake will love these! 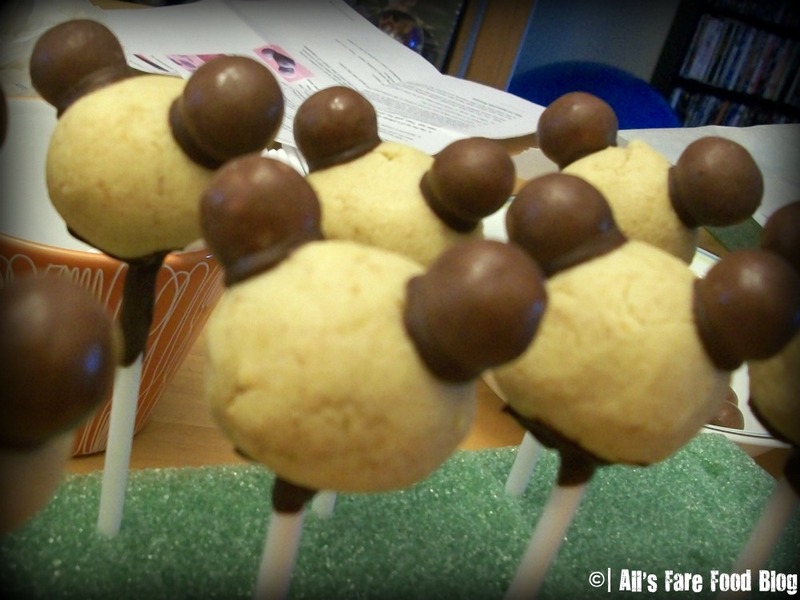 I’m going to attempt to make the cake pops for Vin’s birthday this weekend. Thanks for sharing.